I know that, technically, it’s still summer. I get it, really I do. It’s summer until September 23 and the weather, until then, is fair game. But really, Ms. Nature, 109° in Sacramento? In September? That’s a little extreme, even for you. Especially because you’ve done something with all the water so it’s so dry here, and hot. And the grass is all yellow and crunchy and we can’t walk outside barefoot. Did I mention how hot it was? The kids have been in school for weeks now. Pumpkin recipes are blowing up all over Pinterest. Halloween candy is in the stores. Can you cut us a break, please? I really, really want to drink hot chocolate. And eat soup for dinner. And break out my slow cooker. And make caramel all the things. Also? Some rain would be nice. And snow. Is that asking too much? I mean seriously, you guys. It’s so hot. I’d say “I refuse to turn on my oven” but I actually just got my oven back so it’s been running nonstop. I think I got about four “you’re headed into Tier Gazillion” emails from PG&E just this weekend. But this Caramel Cake recipe? It doesn’t use an oven. It uses a slow cooker. 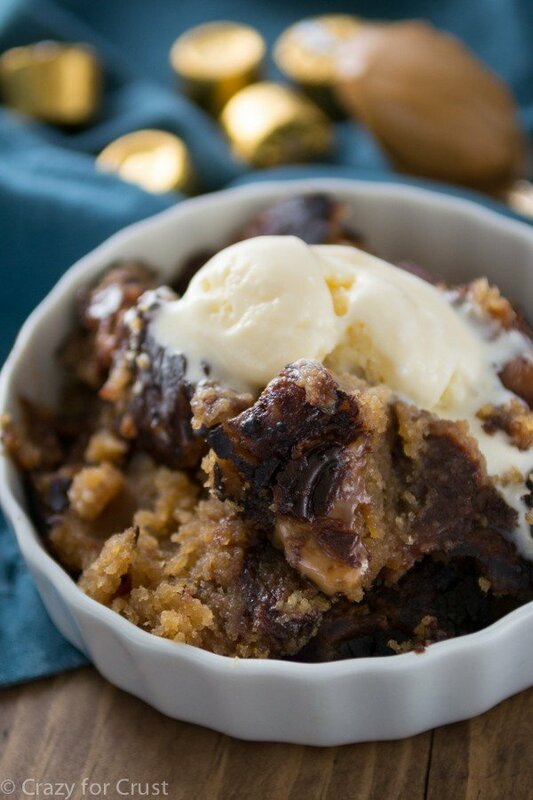 The crockpot makes the best desserts, didn’t you know? It’s not just for chili anymore! I’ve been dying to try another cake in my slow cooker, ever since y’all loved the last one. 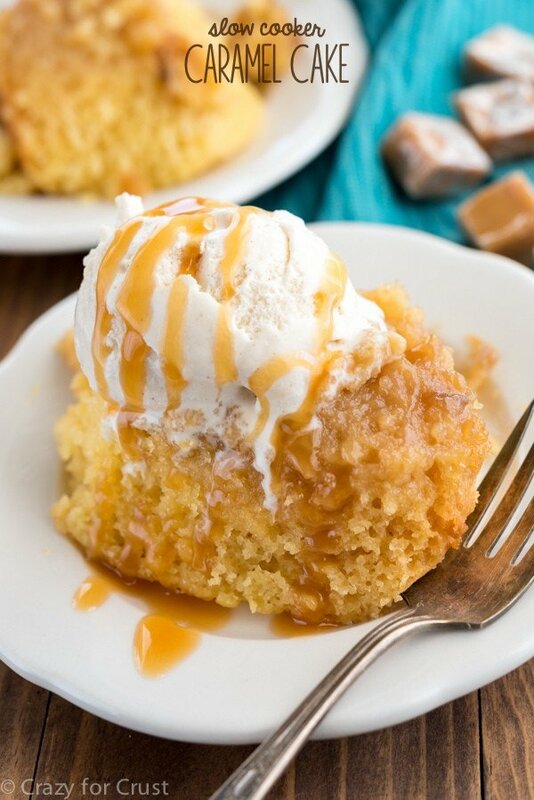 This Slow Cooker Caramel Cake is probably one of the easiest things you’ll ever make and there is caramel in every bite! It’s delight in a bite, get it? This cake starts off with a cake mix that I doctored with International Delight Caramel Macchiato Coffee Creamer. Do you use coffee creamer? What do you create with it? I love adding it to my coffee, but I can’t help but go beyond the cup. I love using creamer to amp up my favorite recipes. Coffee creamer is great in frosting, ganache, dip, pie, martinis, and baked goods. It’s also good in cake! You can substitute creamer 1:1 for milk or water in most recipes. I made the cake as directed on the box but I used the creamer instead of water. The creamer adds a caramel richness to the finished cake. 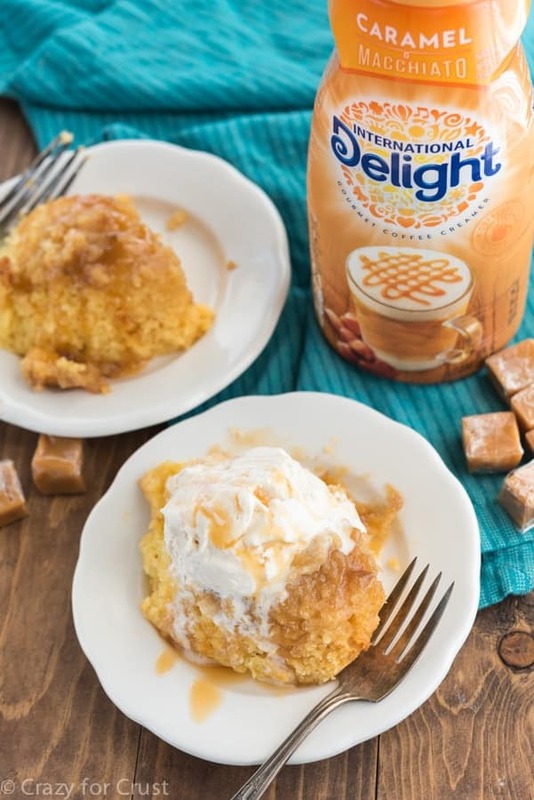 You can use your favorite flavor creamer, but since we’re also adding caramel sauce to the recipe, you might want to stick with the Caramel Macchiato, Vanilla, or even Pumpkin Spice. 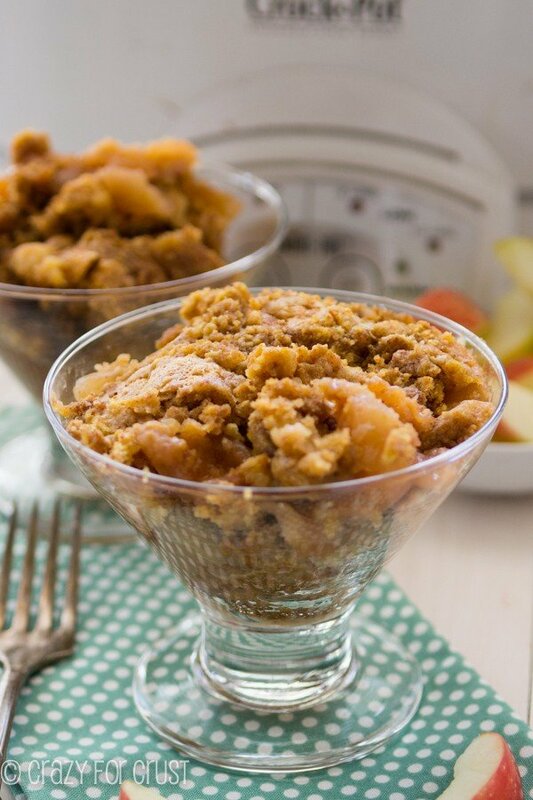 There’s a little bit of experimentation that goes into baking in a crock pot. Every slow cooker is different and cooks differently. Yours may cook more in one area, mine might get hotter, etc. You really have to play with baking in it a few times before you really get to know your machine. One of the important things to do when you bake in a slow cooker is to spray the inside with nonstick cooking spray. If you forget, you’re going to have a very messy clean-up, especially for this caramel recipe. I was without a kitchen sink when I made this so I went the easy route and used a Slow Cooker Liner that I also sprayed with nonstick spray. Those things are amazing, if you’ve never tried them. Cleanup is as easy as throwing the liner in the trash! Once you have your cake batter, you pour it into your prepared crock pot. Then you make a simple caramel sauce using boiling water, brown sugar, and butter. You pour it over the top of the cake batter carefully, then cover the insert of your pot with a paper towel and the lid. The paper towel is to catch any condensation – you don’t want a wet and soggy cake. After about an hour and a half, you can start checking on your cake. If it’s still very much batter in the center, it’ll be at least another half hour (or more). If it’s starting to look done, check it after 15 minutes. A toothpick test will work once you’re done, but there will be some crumbs sticking to the toothpick. The cake is very moist, but it’s not wet. And it totally smells like fall, BTW. 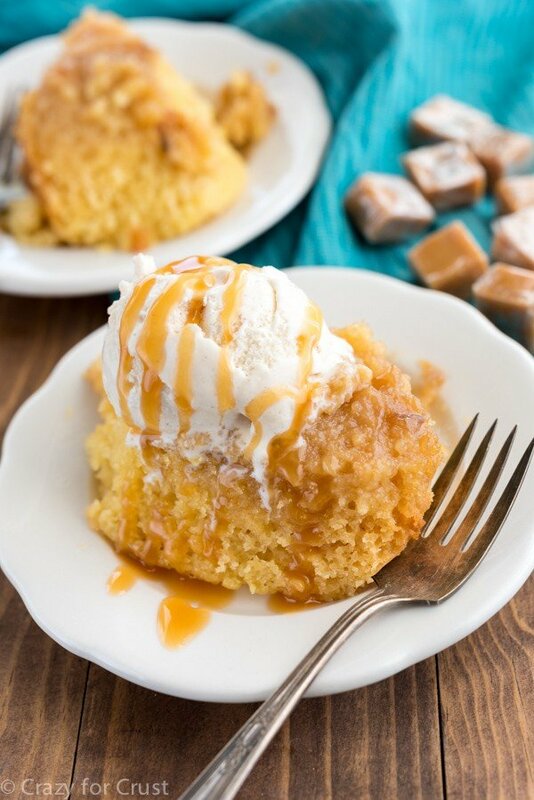 It’s sweet and buttery and full of caramel flavor, perfect served warm with ice cream. 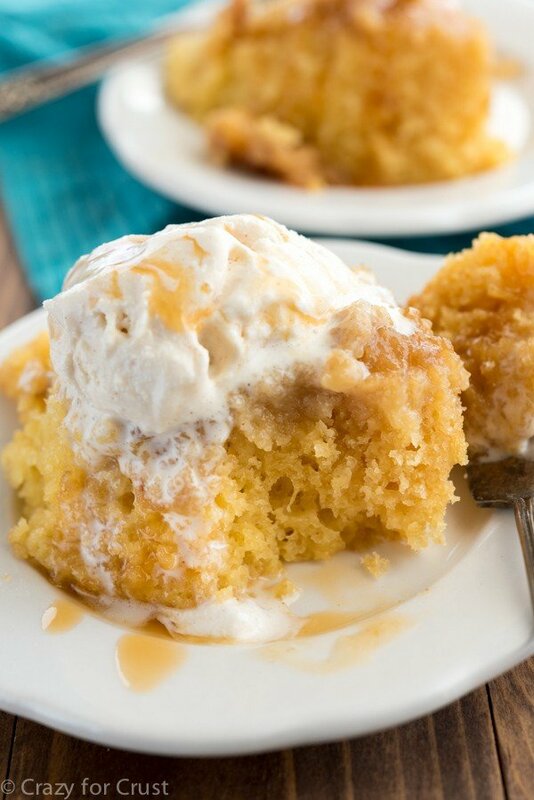 This Slow Cooker Caramel Cake is one of my favorites!! It's easy to make, smells like fall, and tastes like the perfect cake! 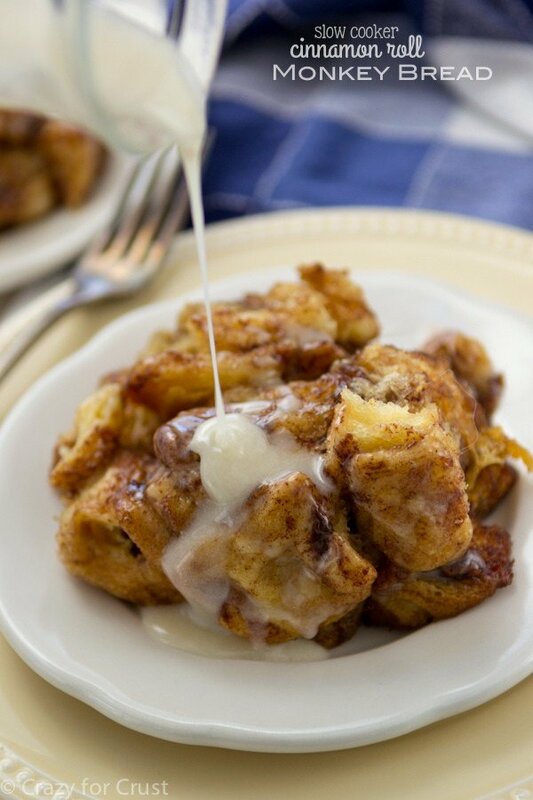 Stir cake mix, creamer, oil, and eggs in a large bowl with a whisk or a hand mixer until smooth. Pour into prepared slow cooker. Heat water until boiling in a microwave or small sauce pan. Whisk in brown sugar and butter until the butter is melted. Slowly drizzle over the cake batter in the pan. Cover the crock pot with a paper towel then place the lid on top. The paper towel is to catch any condensation so it doesn’t get the cake wet. Cook on high power for 1 1/2 to 2 1/2 hours. There is quite a range of cooking time because all crock pots cook differently. Start peeking at the cake after 1 1/2 hours. Once it no longer looks like batter, check with a toothpick to check for doneness. A few crumbs will stick to the toothpick when it’s done. Serve warm with caramel sauce and ice cream. Store in refrigerator for up to 3 days. How do you create delight? Check out International Delight’s new Delightful Moments website to play games, get recipes, and more. Subscribe to get emails, or check them out on Facebook, Twitter, Pinterest, or Instagram. I would eat this cake in any temperature, it’s just perfect! I agree, coffee creamer is so good in so many things! Made this today, it was very disappointing. Not very good at all. Followed the recipe exactly. It took about three hours to cook completely. The cake had a very pronounced egg flavor, could not really taste any caramel. I did not even finish the portion I served myself and actually will throw the entire thing out. It is certainly not worth the waste of calories. Another Internet recipe FAIL! I’m very sorry you didn’t like it Dave. That is very unfortunate. My whole family loved it and ate way too much of it! I guess this is a time when tastes are different for different people. To me it tasted like sweet cake (with the cake mix flavor) and I definitely tasted the caramel. As for the cooking time, all slow cookers cook differently. What takes 2 hours in mine might take 3 in yours and 1 1/2 in another. It’s almost impossible to give exact time for a slow cooker dessert, as I state clearly in my directions. my current caramel obsession means that this cake is pretty much nirvana to me! I’m not sure about doubling – I would worry that the cake wouldn’t cook in the middle but would get too done around the edges if the crock pot is too full! When this cake was done, @2 hours in my crockpot, it was sitting in the brown sugar and water mixture. What gives? Is this the way it’s supposed to be? What do you do with all that liquid? I poured some over the cake, but it’s not like a syrup. The cake is now cooling, sitting in a container, but very soggy from all the liquid. This cake might taste OK if you didn’t pour all that water mixture over it. What a Waste of time and ingredients. The mixture should have thickened a bit as it cooked. It’s not thick like pudding, but like a dippy caramel to drizzle over the top. I’m not sure what happened. Did you make any substitutions? I agree the caramel syrup is too watery. Please confirm the amount of water as I’m making this cake right now for company! Thanks!!!! It thickens as it cooks! Regarding the Carmel during dump. A little confused. You talk about putting it directly in the crockpot; but then you reference a pan. Should a pan be used? If so,what size? I did make this recepie. it tastes very good. Im not sure how it was supposed to look coming out of the crock pot, so Im not sure it was right. Mine was cooked in the crock pot for 1-1/2 to one hour 45 minutes. one end was a little darker. All the drizzling liquid ended up on the bottom. Was it supposed to happen like that? I did use the crock pot liner! What a great invention! And great tip about the paper towel under the lid. I will probably make this again just to see if it turns out the same. Thank you so much. Substituted a mashed up banana instead of the coffee creamer (left everything else the same) and it turned out great.